September 2007 – Route 79 Journal . 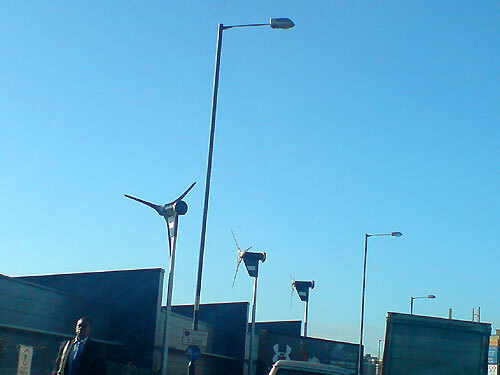 There are some windmills on the A406 North Circular. Right opposite the big Tesco next to the IKEA in Wembley. They seem to be mounted on a new low-rise shed-style building that rose a little like a phoenix from the ashes of the red-brick office monstrosity that stood there for years before being demolished. The windmills sort of symbolise eco-friendliness and environmental kindness. They seem to send a guilty statement to those of us stuck in our cars in the traffic jam on the North Circular Road below, crawling slowly towards the Hanger Lane Gyratory. Windmills on the North Circular. I have to admit they do look a little out of place where they’re situated. You don’t expect to see things like that on the side of the North Circular. And forget about all the times you’ve had a dish by the same name in the office canteen or non-Spanish restaurant, this is the method I picked up in Madrid. And it’s pronouced “PerYAYer” – not “Pie Ella“. 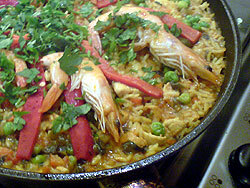 Paella: Tasty, easy to make. Made for sharing. 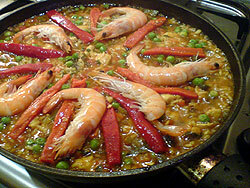 Click here to learn how to make this really tasty dish. 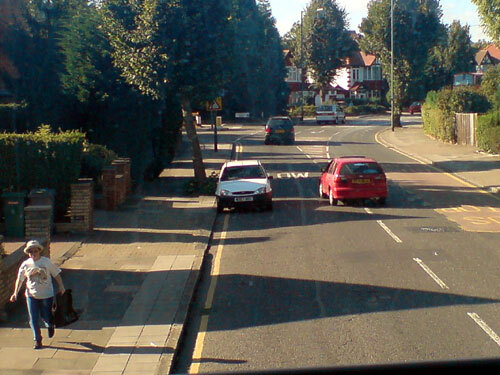 The lady with the hat is running for the bus. She didn’t miss it. But I’m missing mine. You know how sometimes you wake up in the morning and really wish you were standing on a sandy beach in glorious sunshine and nice cool breeze throwing flat stones into the sea and trying to make them bounce on the surface of the water? Well yesterday I got out of bed early, fired up Google Maps and looked for the closest beach to my neighbourhood by tracing an imaginary, dead-vertical line from North West London down to the Southern coastline of England. It turns out that such a place is only an hour or so drive away and is called the London Borough of Littlehampton, and that’s where we spent the day. It was brilliant; the sunshine, the breeze, the sand, the sea, the views. Press the green button in the Shockwave Flash object below to load up a musical montage of cameraphone snaps from yesterday’s daytrip. Turn up the volume and regret that you didn’t make it down there yourself on what was probably the last glorious day of this summer. Littlehampton has an excellent beach. Music was “Summer Son”, courtesy of Texas, 1999. As you can see from some of the pics in the slideshow, turning up to the beach at Littlehampton early in the morning means you have a lot of it all to yourself. This is very unusual for the South coast of England. The journey there is also interesting. There are some breathtaking wiews over the hills and valleys of the South Downs to absorb as you go South via the A283 and A284 approaching Arundel. 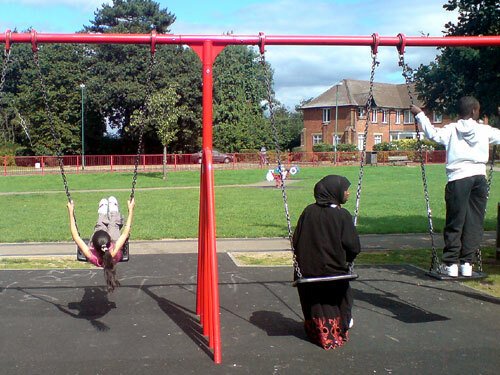 I remember the days when I would wait in eager anticipation for a swing to become free at my local park. Children on the swings in the local park. It was a race to get there first. But when you did, it was a lot of fun right up to the point you were called to go home. 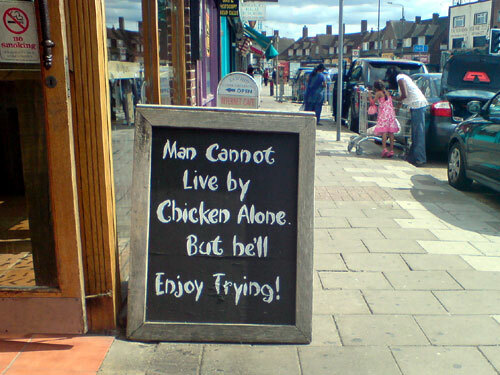 Fast food chicken restaurant chain Nando’s likes to put chalkboards out on the pavement with witty phrases on them to try to tempt people inside. Nando’s chicken restaurant teaser board.